There are a bunch of locally produced TV commercials that deserve posting on this site. You can see a few if you click on COMMERCIALS in the right-hand column. But this ranks right up there with those newspaper ads that say, “One Day Only Martin Luther King Day WHITES Sale!” Really? 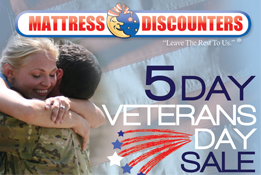 Mattress Discounters is honoring Veterans Day with 5 incredible days of mattress savings. Look for unbeatable deals throughout the store! Oh… what a great way to honor our Veterans, PUT MATTRESSES on sale!!! Why not, they’re just like the sleeping conditions our veterans get when they’re deployed – “Latex, Memory Foam, Adjustable Mattresses.” But wait. So they’re using the day to sell mattresses. But at least they paying tribute to Vets, right? OK.. what was missing in the “We Honor Veteran’s Day” commercial? Oh wait, we have it!!! This should be you’re ad, “We’re honoring our Vets with our new “feel-like-your-sleeping-on-a canvas-cot-or-a-sleeping-bag-on-a-mound-of-sand-with-dangerous-mortar-fire-blowing-up-in-the-distance” mattresses?? This Veteran’s Day “Special” also includes a free Dyson fan that blows sand into your face, eyes, ears and every other body crevice WHILE you sleep! As silly as it sounds, it seems a whole lot less exploitive than your 5-day sale “tribute.” Here’s another ad idea for around Christmas, “If you don’t buy a mattress as a gift for your spouse, PUPPIES MIGHT DIE,” Ya Jagoffs! 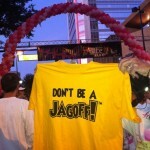 By the way, go buy a “Don’t Be A Jagoff” t-shirt by clicking on the pic below. We actually HAVE sent some free ones to some Pittsburgher millitary staff! But we mainly sell them to raise money for Breast Cancer Research at Magee Women’s Hospital.